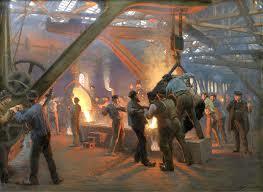 The production of iron and steel in foundries required large quantities of fuel, such as coke. This fuel was needed to heat the blast furnaces. Technological innovations such as the Bessemer converter, allowed foundries to produce large quantities of steel, as well as a better-quality product. These new machines also used fuel more efficiently.